As a cook, I am always trying to broaden my horizons. Whether it's trying new and exotic flavors, or learning new technique, I am always up for the challenge. Recently those challenges have led me to the world of casseroles. I know crazy, right!?! But the truth is, casseroles were not something I was brought up on. Try as I may, I can't think of one casserole that my mom or dad made for us. This is why they are such a foreign concept to me, but I know most of you love a good casserole for their convenience, so I am trying to learn more about them. This led me to asking my friends about what casseroles they love and the Sour Cream Noodle Bake kept coming up time and time again. I know there are many varieties to this recipe, BUT this one is mine. It is absolutely delicious, and I know you are going to love it! To begin, preheat the oven to 350 degrees and bring a pot of salted water to a boil. This works great if you have an oven proof skillet. It is truly a one pot dinner then, but if not you can transfer it into a baking dish. Place a deep skillet over medium high heat and allow the pan to get hot. Then add the ground beef to the pan. Let the meat cook until it is no longer pink and it fully browned. Pour the noodles into the boiling water. Let the cook according the directions on the package. Once the meat is brown, pour in the marinara. For my homemade marinara sauce recipe click HERE. Let the sauce come to a simmer. While the sauce is simmering, you can shred your cheese. Then it will be time to throw it all together! Add the cheese mixture to the sauce. It is at this point, if you are using a separate baking dish, that you would put it in that dish. 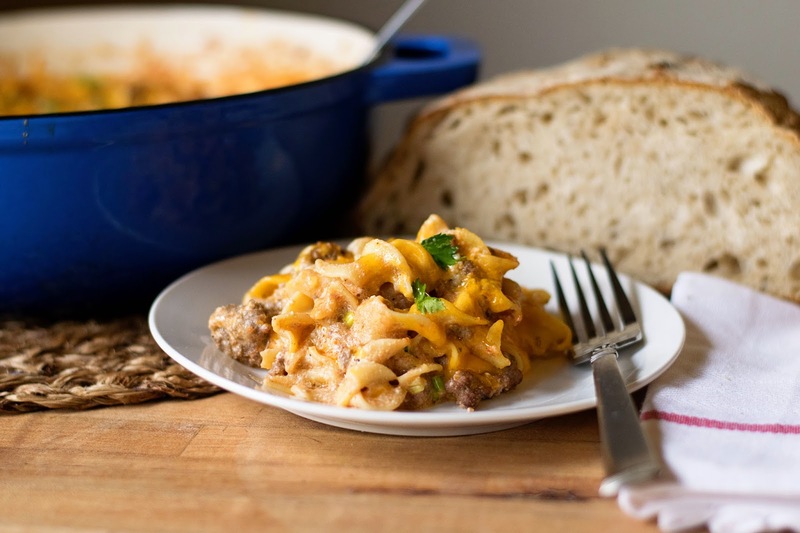 Top the noodle bake with the shredded cheese. 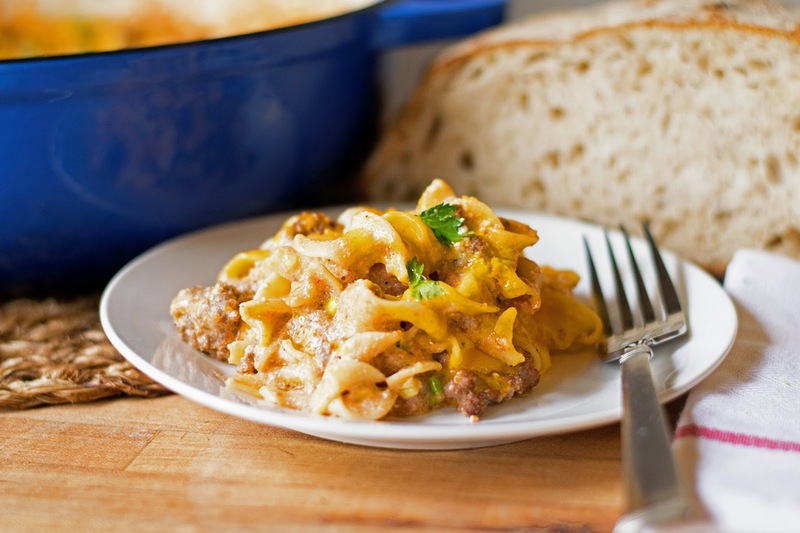 Top with a little fresh parsley and you are good to go! I love to serve this with a nice green salad or some lovely steamed broccoli. 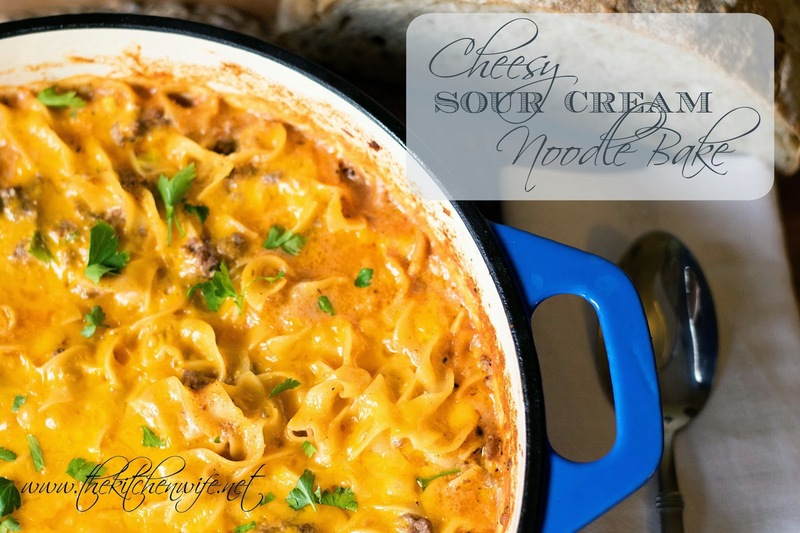 One thing is for sure, no matter what you serve with this Cheesy Sour Cream Noodle bake, you are going to devour it! So get in the kitchen and give it a try TONIGHT! Now pardon me because this plate has my name written all over it! Add the ground beef, onion powder, garlic powder, salt, and pepper, to a hot skillet and cook until totally brown and no longer pink. While the ground beef is cooking, combine the sour cream, ricotta cheese, green onions, salt, and pepper in a mixing bowl and stir together. Pour the noodles into the boil water and cook according to the instructions on the package. Add the marinara sauce to the cooked meat and bring to simmer. Add the sour cream and cheese mixture to the sauce. *It is at this point if you are not using an oven safe skillet, that you would transfer it to a baking dish.